Michael McFadyen's Scuba Diving - Twin Tunnels Most of the dive sites at Tulagi in the Solomon Islands are shipwrecks, planes or equipment left over from World War II. 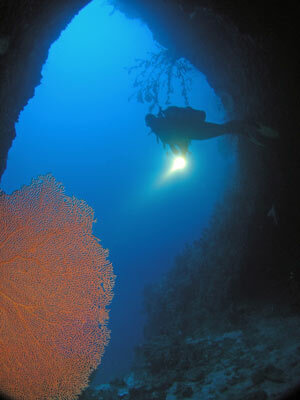 Not many people who go there to dive want to dive on coral reefs. 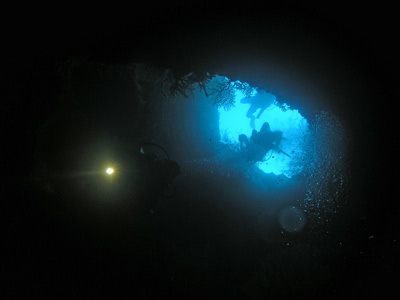 However, there is one site that is worth diving, even if you are a bit of a wreck freak like me. To the south of Tulagi is a reef that comes up from over 60 metres to about 12 metres. About three kilometres south-south-west of Soghonangola Island, this reef is named as Bayldon Shoals on charts but called Twin Tunnels by dive operators. At GPS S9° 8' 49.5" E160° 8' 31.3" (using WGS84 as a datum) there is a mooring. This is located near the centre of the reef. 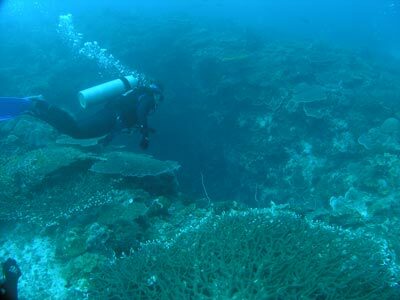 The reef top is perhaps 100 metres long and 75 metres wide. 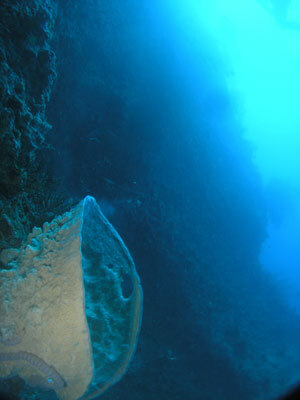 After dropping down the mooring you see two large holes in the reef top, one bigger than the other. These are the Twin Tunnels. You can pick either and enter from the top. Down you drop to 35 metres. As you go, it is quite a view watching the divers in front of you descending and the bubbles coming up to meet you. Looking back up as you go you see a blue circle with the following divers silhouetted against the sky. Fantastic for photographers or videographers, especially if the diver has a strong torch alight. At the bottom the two tunnels join together, with a small cave off to one side where they join. This cave is full of crayfish. From here you backtrack to the intersection and see the exit hole out to the side of the reef. Again, great photo opportunities. The reef drops away here to well over 45 metres but you should start ascending in a gradual anticlockwise climb back to the top of the reef. As you go you will see a few sharks, whitetip and grey reef sharks. Once you get to the 20 metre area stay at this level as you go. You will see huge schools of fusiliers and rainbow runners here and shallower. Soon you will need to be shallower than 13 metres to avoid decompression and this area is quite good. There are the normal fish on this dive, including the friendliest clown triggerfish I have ever seen. I saw at least five here and got the closest I have even been able to when I was videoing them. Truly a great dive site. The visibility on my two dives here reanged from 15 to 25 metres with water temperature of 27.5°C. On one dive we had a very strong current that made it difficult to get down the mooring and to move around the reef top. You can dive this site with Tulagi Dive. See my Tulagi page for more information.